Tandem riders now have a source for lightweight, full-performance wheels: Lew Racing. The Lew Racing tandem wheels are made with the same materials, technology and expertise that have gained Lew Racing legions of fans all over the world. The tandem wheels combine Boron and Carbon to produce the PRO VT-1 laminate that is used to make the rims. But a wheel is only as good as its spokes. 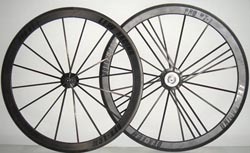 The carbon spokes used in the tandem wheelset weigh only three grams each but are five times stiffer than their steel competitors with three times the compression strength and double the tensile strength. Plus, the spokes maintain their shape at the very critical rim/spoke interface (unlike steel spokes which loose their blade shape) and boast unrivaled cross-wind handling. The result is a super low-aerodynamic drag system that behaves like a bladed steel spoked wheel at a fraction of the weight. The tandem wheelset features 24 spokes on the rear wheel for incredible strength and stiffness and 16 on the front. Plus, the spokes are seamlessly integrated from root-to-tip with hand-crafted Lew rims. It all adds up to an incredible ride on wheels that never need adjusting and stay true for the life of the wheel. "Tandem riding presents a curious problem for wheel building," says Paul Lew, Founder of Lew Racing. "You need to make sure the wheels are strong enough to handle two riders, but also lightweight so that the riders' power is not wasted. And above all the wheels have to give a great ride. I believe we have achieved the strength/weight/performance balance with our new Lew Racing tandem wheels." MSRP of the Lew Racing tandem wheels is $15,000 and are available now. Paul Lew began designing and manufacturing bicycle wheels in 1991. Eleven years ago he developed the Race Lite, a 34 Msi carbon rim  the first and original unidirectional carbon fiber rim. Lew introduced his hybrid 34 Msi and 43 Msi carbon Sub One wheel in 1998 as the first production 1000 gram wheel set.